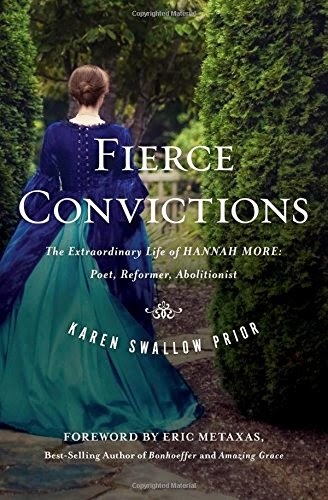 Behold & Reflect: Review of "Fierce Convictions"
When I saw the gorgeous cover of Fierce Convictions, with its elegantly dressed young woman storming through an English garden I couldn't help but imagine the spurned heroine of a Jane Austen novel. The biography's subtitle, The Extraordinary Life of Hannah More: Poet, Reformer, Abolitionist, was even more enticing, promising a heroine whose life pursuits centered on scholarly achievement and humanitarian activism rather than securing a wealthy husband. Though a prominent and prolific writer in her day, Hannah More has been largely forgotten by the 18th century history narratives of today. Karen Swallow Prior resurrects this key figure through extensive research of her letters, literary works and the words of her contemporaries, such as fellow abolitionist and famed orator William Wilberforce. Prior also emphasizes the source of More's extraordinary zeal as her Christian faith, which, surprisingly, grew deeper even as her worldly fame and success mounted. Prior describes More as a "woman of contradictions and convictions" (87), and supports this with ample examples. The book begins by shining light on More's humble origins, her early aptitude for literature (including a witty poem she wrote at four) and her at times awkward and starry eyed rise to fashionable London society. The author also avails herself of the requisite romantic tragedy, devoting an early chapter to Hannah's on-again off-again engagement to a rich but waffling suitor. From here, the book is largely arranged by topic rather than chronological order. This was probably the biggest detractor of the biography for me. I found myself having to calculate More's age with every mention of the date. This broke up the fluidity of her story and her evolving convictions for me. Often it felt like I was traveling back and forth through time rather than riding smoothly along through the protagonist's life. Despite my difficulties with date crunching, I was still drawn into the book and inspired by this amazing woman. Highlights for me included Prior's descriptions of More's abolitionist efforts, like her penchant for whipping out engravings of slave ships during high society dinner parties. Prior also included the full text of More's moving poem "Slavery." My favorite chapter describes More and her sister Patty tromping through the countryside to woo rich and poor alike for support in setting up a school for the rural poor. This project eventually produced dozens of schools and fueled the rise of public education. As a member and often host of the Clapham Sect meetings, More and some of the brightest male reformers worked late into the night hashing out strategies to turn the tide of public opinion away from slavery, cruelty to animals and oppression of the poor. Because she confessed and acted upon a spectrum of timeless moral convictions for improving the lives of "the least of these" and for reining in the excesses of the greatest, More certainly makes my cut for a modern day role model. Yet, though More was ahead of her time, Prior was careful to show that her convictions were tempered by the prevailing culture of her day. More assented to many conservative beliefs that seem backward in today's culture. Despite owing her own rags to riches story to the power and income of her pen, she didn't believe in teaching the poor to write, for fear that they would distribute their own revolutionary tracts. And though More was considered a shining example of female wit and strength, she hypocritically belittled the leadership qualities of women in general, writing in a letter to a friend that "there is perhaps no animal so much indebted to subordination for its good behavior as woman" (213). Ouch. But I don't want to end on that note. Overall, Hannah More's story is one that needs to be read, and her extraordinary life emulated. She struck a delicate balance between living in the world but not of it, and Prior brings to life More's world and convictions in this comprehensive and interesting biography. Hey Tina! I liked the book for the same reasons! If I was mom to tweens, I think I'd want them to read it too, as More is a great role model in many respects.